Sit down, roll initiative, kill monsters, go home. Sometimes every GM will fall into that rut; especially if we have short game sessions. Extra Credits once again gives us tabletop GM advice through the lens of video game design. In this episode, they describe modulating challenge in video games as "differences in scale vs. differences in kind." You can keep a game interesting by ratcheting up the challenge, but it's better to keep changing the kinds of ativities the player is involved in instead of just throwing more and harder challenges at them. Tabletop GMs take note! Simply mopdulating what the PCs fight doesn't change what the players do. Whether you're battling werewolves instead of Sabbat or dragons instead of goblins; the player activity is still the same: Roll initiative, move to strategic positions, attack, use magic, and track wounds. Instead, modulate what the players do. Combat Scenes are where the PCs fight. Players take turns in strict order. In-game time passes very slowly. Characters are restricted to a very limited pool of actions when their turn comes. Movement is often limited. The risk of injury or death is present. Things change quickly, and there is a constant sense of struggle between risk and progress. I've written twice now about how combat scenes should be designed with a variety of end-state conditions other than "kill or be killed," but even with that variety, combat scenes are very similar to one another, even across widely differing game systems. Compare combat in FATE to combat in GURPS, and you will see players waiting their turn in initiative order, GMs drawing pictures of the battlefield, movement speed limitations, and rolls for every attack. A player's skill in combat involves mastering the combat system and using it well. In a combat scene, the system is a player's tool to employ in his attack and defense strategy. Simulation (Sim) Scenes are where the PCs solve a non-combat problem with their stats. I've written about these as well. Sim scenes exist in a half-way land between the fully systematized, abstracted combat scene and wholly free-form, rules-less storytelling. Time passes in fits and starts, without the use of rounds or turns. The results of player character actions are interpreted through the system sometimes, but other times the GM makes a judgement call without using the system. A player's skill in sim scenes involves creative problem solving more than mastering the system as a tool. In a sim scene, the system is the GM's tool to use to add tension or reward creativity. Social Scenes are scenes where the PCs overcome a challenge using a mix of stats and player savvy. However, the range of stats and player capabilities is narrowed. The skills a player can employ are reduced to social skill, acting skill, quick-thinking, and a penchant for politics. The valuable character abilities are reduced to stats related to social (and sometimes "knowledge") skills. However, sometimes a combat character has an easier time in certain social scenes because he knows he can push harder and survive it if his interlocutor attacks him for his impertinence. Large spans of time go past without players rolling dice, and often some characters' stats aren't used at all the entire time, though they may participate. Often the GM "does voices" and the players move from around a table to standing or sitting in another room or even outdoors to increase the scene's verisimilitude. 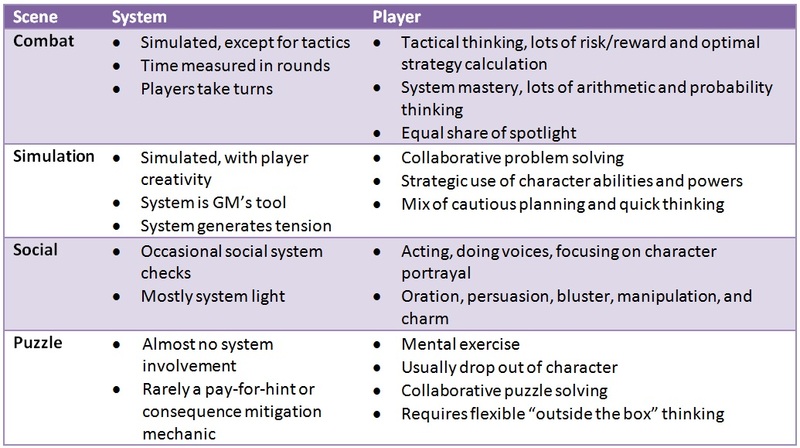 In some ways social scenes are like sim scenes -- player ingenuity and character skill combine; smart strategy and creative thinking are important; the system is a tool for the GM, more than the players; and the players are doing problem solving. In many ways, it's different, though. For one, a good deal of the action is not simulated. In a sim scene, if your character picks a lock, you don't have to actually pick a lock. But in a social scene, if your character gives a rousing oration, you are usually expected to give a speech. It's understood that your character, a grand master orator, does a better job than you (depending on die rolls); but you still have to talk! Puzzles are scenes where the players have to solve a problem without their characters' stats. There is almost no place for character stats in a puzzle scene, though they are often mixed with sim scenes (a riddle as part of a trap, for instance). The distinctive characteristic of a puzzle scene is that the players' minds are tested. Commonly, GMs allow players to use system currency (Willpower points, FATE points) to get hints or reduce the consequences for failing or taking too long at the puzzle; but actually solving the puzzle is ultimately the players' responsibility, irrelevant of their characters' stats. This scene is similar to a social or sim scene in that player creativity and quick thinking is important; but different in that player brainpower is all-important, and a player cannot fall back on his character's skills. What a player does in each kind of scene is different, which is valuable to a GM modulating player interest through the course of a game session or adventure track. Any particular RPG will have a different mix of these depending on the story or moment in the story. E.g. 1) Modulate player activities. Change what the player is actually doing from scene to scene. In a tabletop RPG, don't just run fight after fight -- insert other kinds of scenes with different player activities. These keep things feeling fresh, and each scene is a new kind of challenge, letting the players shift mental gears. 2) Keep some focus. Give players a chance to get into each scene before switching. And don't switch to a totally new scene every time: Come back to the same styles over and over, with breaks in between, so players can get better at them. In an RPG, this helps players define their characters in different kinds of scenes.